Last month when the first water cooled Bitcoin ASIC miner from Bitmain – AntMiner C1 was announced you had to either buy the water cooling kit separately from another supplier or use your own components for completeling the water cooling of the miner. It seems that for Batch 2 of the Bitmain AntMiner C1 the company has decided to actually sell the full kit to customers, making it easier and more problem free for the users that now get a complete solution. The price of the miner is the same as you could previously order it if you also included the suggested water cooling kit – 400 USD (1.092 BTC). As we have previously mentioned the components that Bitmain previously suggested and now includes with the miner for the water cooling solution are available at a quite good price as compared to wath you normally have to pay for some high-end water cooling components. So a good deal as apparently this kit should be able to do just fine in cooling the miner and keeping the noise level low. Bitmain Antminer C1 is a new interesting offer coming from Bitmaintech, a 1000 GHS Bitcoin ASIC miner with water cooling. The new Antminer C1 ASIC miner comes in a kind of DIY form as Bitmain is only selling the mining unit with integrated water block for the ASIC chips, the rest of the cooling you need to buy separately and install yourself. The Antminer C1 miner is being sold for 1 BTC or $349.34 USD at the moment and you can buy a ready kit with the rest of the water cooling components for extra $50 USD or use your own components to complete the cooling solution of the miner. 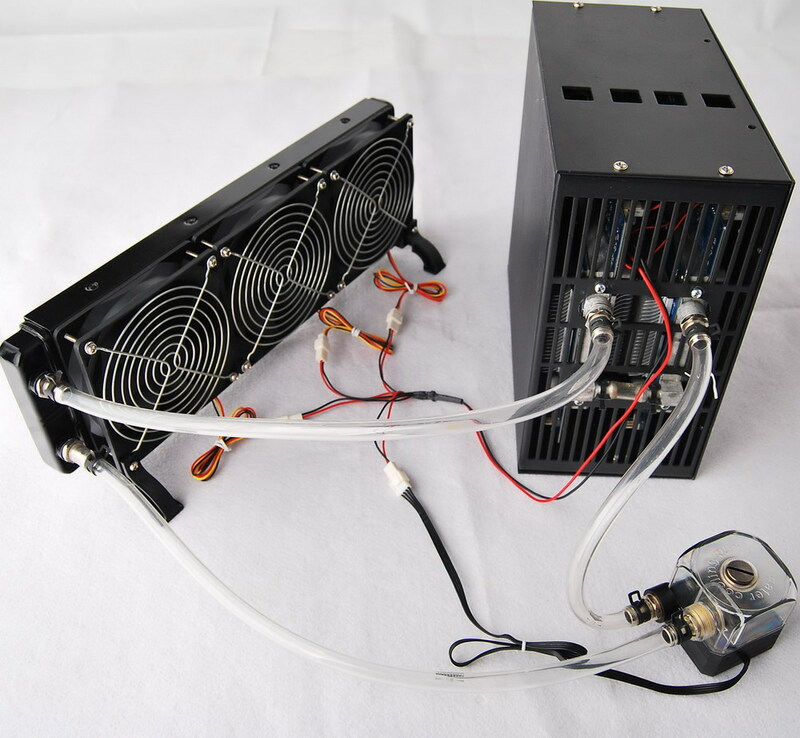 The C1 miner is offering 1000 GHS hashrate with a power consumption of about 800W according to the specifications quoted by the manufacturer and you will have a bit more power usage for the additional fans and the water pump for the water cooling part. The new Bitmain Antminer C1 Bitcoin ASIC miner with water cooling should offer a quieter operation, making it suitable for use by home miners and with the winter coming this could turn out to be a nice combination of quiet device that provides you with a heating for the winter. The drawback with the Antminer C1 using this approach for water cooling is that it may not be suitable for everyone, especially people with no experience in water cooling solutions for computers, even though the suggested ANT C1 kit should be easy to install. The miner does not come ready to be used and you need to buy extra hardware form a separate supplier, a decent and cheap choice apparently offered as an option, or use more expensive and serious PC water cooling components to make the miner operational.